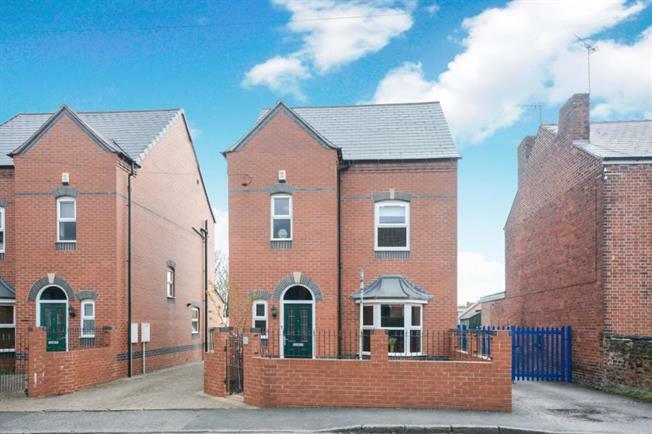 4 Bedroom Detached House For Sale in Chesterfield for £280,000. Excellent four bedroomed detached home. Favourably located in the popular area of Newbold this nicely proportioned four bedroomed detached house with enclosed rear garden is perfect for a family standing within easy reach of a good range of local amenities and public transport links. The property briefly comprises of entrance hall with access into the living room with feature bay window and double doors leading through to the dining room with access to the rear garden. The modern kitchen has a range of wall and base units and fitted appliances. Stairs lead to the first floor and three of the bedrooms with bedroom two benefitting from an en-suite with w.c, wash hand basin and shower. The family bathroom is also located on the first floor and has w.c, wash hand basin and bath. Further stairs lead to the second floor and master bedroom with en-suite benefiting from w.c, wash hand basin and shower. This property truly needs to be viewed to fully appreciate the standard of the accommodation on offer. Newbold is a village very close to Chesterfield town center. A host of local amenities include, shops, pubs,schools, doctors and dentists. Towards the end of Newbold Road there is Holme Brook Reservoir and Country Park, designated a site of Importance for Nature and Conservation. It is host to a variety of plants, insects and animals with a large woodland plantation. It has popular walking and cycling routes, some of which lead to Linacre Reservoir. Excellent commuter routes via A617 to Junction 29 of the M1 motorway network along & within easy reach of Chesterfield railway station providing easy access to Sheffield, Derby & Nottingham.